What are Some Objections to the Use of Battery Cages? Battery cages are crowded and do not allow free movement. 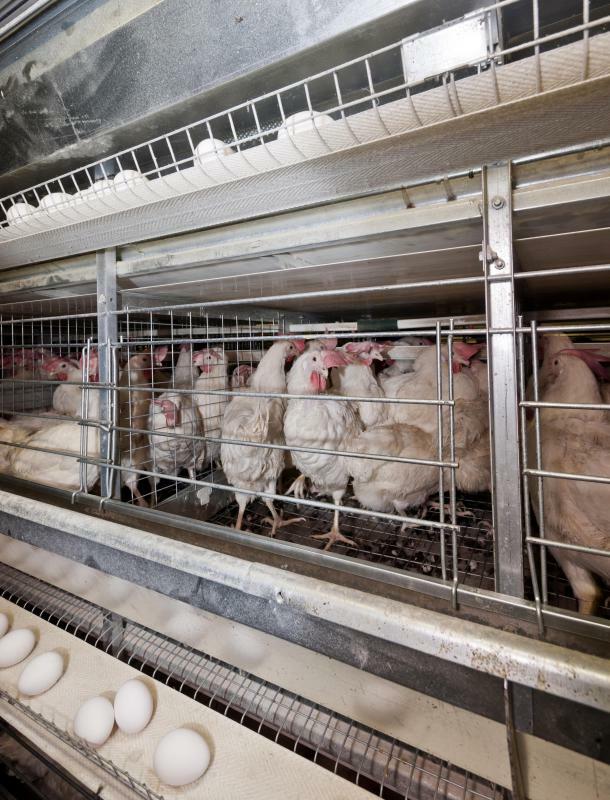 Battery cages are cages which have been designed to maximize the efficiency of chicken egg production. Although they are in wide use throughout the industrialized world, some people have raised concerns about the use of battery cages, arguing that they pose a potential health risk and that they are are inhumane. These objections are certainly something to be considered when you are buying eggs at the market, as organizations who are opposed to battery cages argue that consumers should vote with their pocketbooks, pressuring major egg companies to explore alternatives to battery cages such as raising free range chickens. The battery cage design was developed in the 1930s, and it quickly became a runaway success. The basic design includes a slanted floor which allows eggs to roll onto a conveyor belt, making collection very easy, along with troughs for food and water. Most battery cages are made entirely from wire, allowing droppings to fall through the floor for easy collection and cleanup, although when battery cages are stacked, this design feature can cause rather unpleasant results. Most battery cages are also extremely small so that they are space efficient. From an animal rights perspective, there are a number of problems with battery cages. Many people argue that they are inhumane because the hens often cannot turn around in them, and their feet may actually grow through the wire, essentially locking the hen into place in the cage. The limited space makes living in a battery cage very stressful for a hen, and some hens develop stress responses such as viciousness or self destructiveness. Because battery hens tend to get vicious, many egg producers debeak them, removing their beaks with a heated knife so that they cannot peck each other. In addition to being painful, debeaking is also potentially dangerous to the health of the hen, as infection can set in. Crowding can also cause health problems, as it does for many animals. As a result, antibiotics are routinely fed to battery hens, ensuring that they stay healthy. This is a major concern for people in the field of public health, as the routine use of antibiotics can contribute to the development of antibiotic resistant bacteria, which can be passed on in the eggs that the hens produce. Some people also believe that eggs produced by battery hens are inferior. This is because the hens do not eat a diverse, nutrient rich diet. 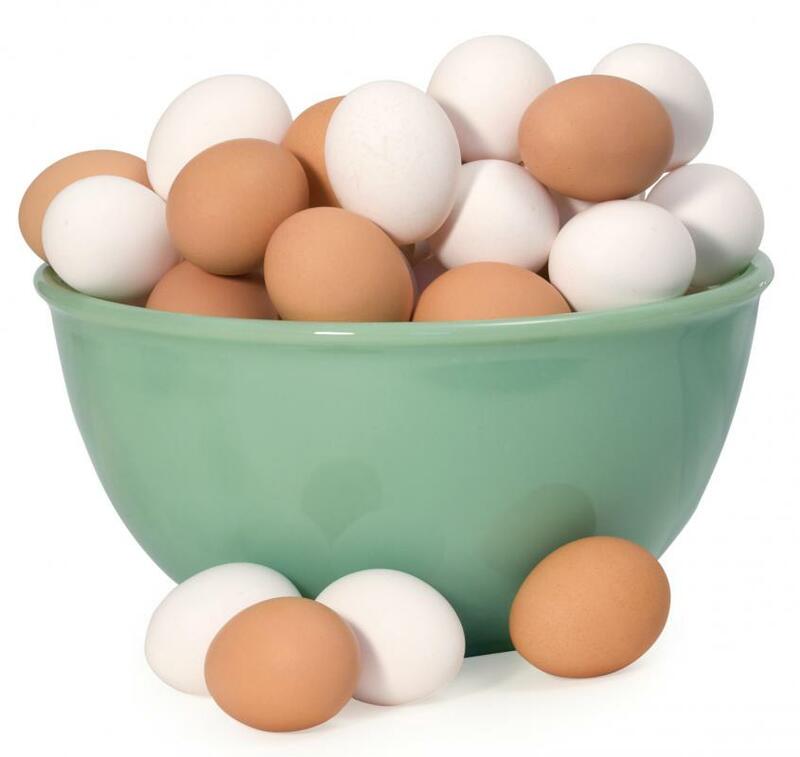 As a result, their eggs tend to taste flat and bland, and they have dull yellow yolks as opposed to the rich dark golden yolks produced by chickens eating a varied and balanced diet. These critics of battery cages argue that inferior eggs are not as healthy for their consumers, and that these eggs also simply do not taste as good as eggs from free range hens. What is a Cornish Game Hen? Do Poultry Make Good Pets?